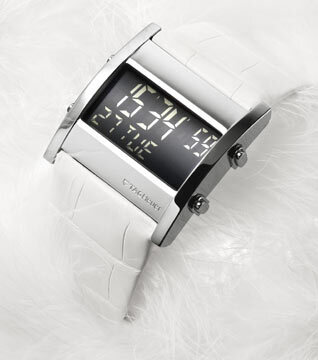 Power, precision, and style elegantly bound by a white alligator strap. The Tag Heuer Limited Edition Women’s Microtimer White Alligator ramps up to meet the expectations of women who were first drawn to the avant-garde styling of the original Microtimer. Taking the high-tech glamour of the Microtimer, Tag Heuer softens the edges a bit with the femininity of a white alligator strap. Like its predecessor, the Micrograph Formula 1, the Microtimer White Alligator builds on the 150 year tradition of Tag Heuer’s founders — entrepreneurship, innovation, an obsession with ultimate precision, and a deep love of prestigious sports. Accurate to 1/1000th of a second, the Microtimer White Alligator is fitted with a traditional chronograph with total and split times and a stand-by mode to shut off the display. A range of functions, such as the second time zone display, make this the watch of choice for avant-garde women on the go. Whether commodoring a yacht, watching the Ascot or enjoying a leisurely afternoon of golf, the Microtimer White Alligator’s digital display and Swiss quartz movement guarantee the wearer optimum readout and exceptional precision. A scratch-resistance, anti-reflective crystal ensures ease of readability no matter what the conditions. The watch is also water-resistant to 100 meters. Like the forward-thinking women whose sense of style inspired this watch, the Tag Heuer Microtime White Alligator is not bound by ordinary needs or custom. Sleek and powerful with a refined sensibility, this is a watch for a woman who is sure of her own prowess and not afraid to challenge convention. Due to its special edition status, the Microtimer White Alligator is only available in limited supplies from your retailer. Sleek and powerful the Tag Heuer Special Edition Microtimer White Alligator is a watch for a woman who is sure of her own prowess. Great job condensing all the specs to a single paragraph. I enjoyed the chewy factoid center of this highly stylistic piece. Wonderful goods from you, man. I’ve understand your stuff previous to and you are just too magnificent. I really like what you have acquired here, really like what you are saying and the way in which you say it. You make it entertaining and you still care for to keep it sensible. I can not wait to read far more from you. This is really a great web site.